As a brand, EA Group have been synonymous over many years with the art of making an entrance. Combining advanced security integration, automation technology with reliability of service and quality of standards. Supporting a wide range of products and services, EA Group is an established quality brand for the integration of security systems and entrance solutions. Our clients are a broad mix from many market sectors that include; police forces, airports, banking, pharmaceuticals, facilities management, government, hotels and leisure, councils, and education to name a few. EA Group is part of the Electro Automation group of companies with a pool of resources, facilities and talented personnel within office in Surrey, Dublin and Lisburn, we have the proven track record to deliver high quality security and entrance solutions across the UK and Ireland. The Company was originally founded in 1983 providing high quality automatic gate installation and maintenance in the Home Counties. In 1995 Perimeter Security (EA) Limited was incorporated as part of the Electro Automation Group of Companies to increase its product portfolio. EA Parking was established in the year 2000 as a sister company to Perimeter Security, to supply, install and support a range of “Pay on Foot” Car Park equipment. To consolidate the two disciplines Perimeter Security (EA) Limited changed its name in August 2003, amalgamating the two companies into EA Group (UK) Limited. Due to the acquisition of Automatic Door Maintenance Limited (ADMI) in July 2007, consequently EA Group was able to further increase its knowledge and portfolio. Thereafter also acquiring a working partnership with KBB Doors. With its Head Office located in Bookham, Surrey, EA Group (UK) Limited provide a comprehensive installation and support service within the entrance solutions and security systems market sectors. We are an NSI Gold level security company. This demonstrates that our quality and operating standards meet the highest level within the UK further supported by our ISO 9001, ISO 14001, ISO 27001, ConstructionLine, ADSA and CHAS accreditation’s. Contract administration, project management, technical support and 24 hr, 365-day service are all coordinated from Bookham. All of our personnel are directly employed, and they are security screened by the Surrey Police and furthermore vetted to BS7858:2012 standards. 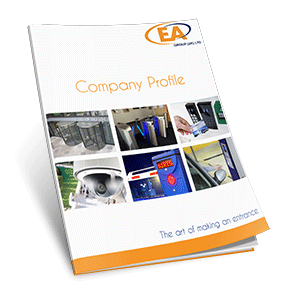 EA Group (UK) Limited was developed to provide a comprehensive installation and support service, within the access control and security markets. Over 30 years on, we remain committed to develop new business streams compatible with the EA Group philosophy of providing a progressive attitude to new technology, service delivery and meeting the needs of our customers and staff, with a flexible and workable approach. A summary of our agile company and an insight into the various different entrance and security solutions we integrate, from revolving doors, to speed gate turnstiles, gate automation and access control.